We deliver in-depth planer and joiner reviews to let you know the best products with the best durability and features for your woodworking projects. If you’re a carpenter, knowing who makes the best planers and joiners can increase productivity. They can also raise the quality of your work. We’ve reviewed everything from the Festool Domino DF500 mortise & tenon joiner to the new Milwaukee M18 planer. 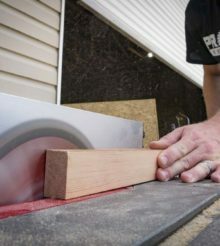 Putting tools in the hands of a real woodworking professional lends credibility to our planer reviews and joiner reviews. Doing this allows us, and more importantly—our readers—to get a feel for how these tools perform in the real world. From vibration reduction to cutting and planing efficiency, Pros know what makes a good tool. They also know what makes a great tool. Any good review lets Pros know the skinny on tools from professionals who use them for a living. As we review more and more tools, our knowledge base grows. That means our ability to really distinguish the finer details of what makes a tool great grows as well.